VACATION RENTAL LICENSE VR-160... MINIMUM STAY 7-NIGHTS. Rates from $1,195 to $1,695 per week and $4,800 to $5,595 per month, request quote for pricing based on your specific dates. Holidays including mini lobster week - 15% additional. Beautiful three bedroom/two bath canalfront home with 60' wide ample concrete dock, and fish cleaning table. Pristine and impeccably clean. White tiled floors, carpet in bedrooms. Central a/c. Fully equipped kitchen with microwave, glass top range with full size oven, refrigerator with icemaker, garbage disposal, dishwasher. All cookware, flatware, glasses, utensils, gadgets, small appliances are provided. All bedroom linens, kitchen linens and towels are provided. Full size washer and dryer in laundry room. Master bedroom has a king size bed, full private bathroom, and loft area. One additional bedroom with queen size bed and second additional bedroom has two twin beds. Ceiling fans throughout and beautiful single panel glass French doors which lead to fabulous circular tiled balcony terrace. Beautifully decorated interior and magnificent modern architectural design. Vacation Rental License VR-160: Amenities; living room with television. All bedrooms have flat screen tv's. Circular wide custom made staircase which goes from first floor foyer to third floor master bedroom. Located between Tavernier Creek Canal and Snake Creek for easy access to the ocean side. All you need to bring are your personal items. This home will truly make your vacation in the Keys a vacation in paradise. --- Wide 60' concrete dock, fish cleaning table, circular tiled balcony terrace overlooking canal, four Television sets. Central a/c, ceiling fans, Refrigerator, range/oven, microwave, dishwasher, garbage disposal, Full size washer and dryer in laundry room, Coffee maker, blender, hand mixer, iron, all small appliances, All bed, bath & kitchen linens. Patio chairs & tables, outdoor charcoal grill. Two cars Carport. Trailers for boats over 21' must be stored off-site. Maximum size trailer that may be parked at the property is 21', no exceptions. Islamorada Founders Park: Just 2.5 miles south, 5 minutes driving, is Islamorada Founders Park at MM 87 Bayside, which offers activity or relaxation for the whole family. An Olympic-sized pool with diving area, a shallow water beach, water sports rentals, ball fields, fishing jetty, bocce, tennis and basketball courts, vita course with 18 exercise stations, multi-purpose path, skate park area and dog park area all are within the 40-acre park. Fees may apply. Village municipal parks also include the Islamorada Library Beach and Anne’s Beach. There is the Windley Key State Geological Site, a state park, at the site of a former coral rock quarry. In addition to shady walks through unique foliage, fossils of sea creatures can be seen throughout the park. A free guidebook is available at the visitor’s center for use during your stay in the park. Islamorada also offers an 18-mile bicycle path that extends the length of the Village. Luis & Ena Jane are the original owners of this home. We put all of our love and sacrifice into making this dream come true and we want our guests to be able to enjoy and love this home as much as we do. We bought the vacant lot in 1991 and built our beautiful home in 1997. The dream is to one day retire in this oasis but in the mean time, we want you to be able to make memories in our little piece of heaven. 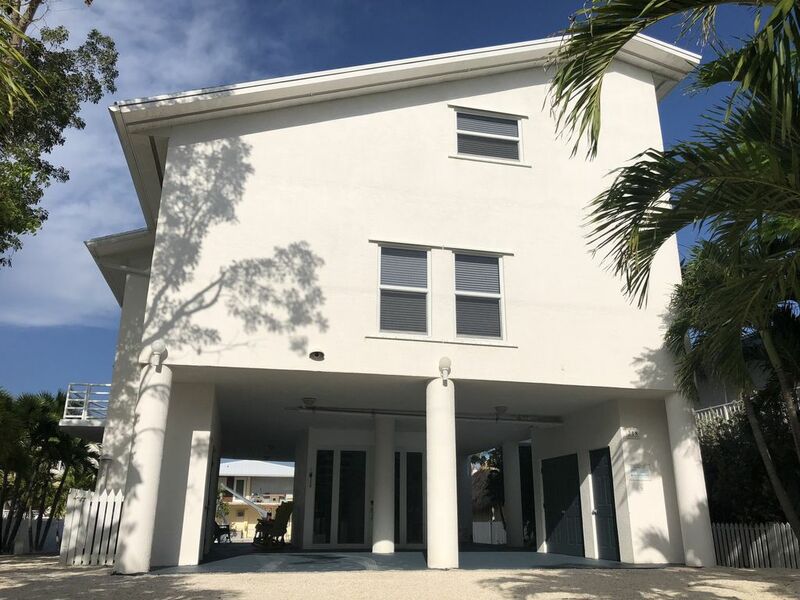 This home is conveniently located within the Village of Islamorada on the bay side, less than one mile from the Village of Islamorada Founder's Park. You will feel as if you are in your own home with many personal details to make your stay very welcoming. We have a beautiful expansive balcony for relaxation and enjoying a cool drink in the afternoon or sunbathing in the morning. Covered parking for two cars because even though we don't want it to rain when in the Keys, you will be assured a dry and convenient arrival on those rare occasions when it does. Plenty of outdoor seating for just relaxing or reading a book. Perhaps you will enjoy fishing right off of the dock. We are just a phone call away should you have any questions or concerns before or during your stay. Thank you so much. Hope to welcome you back in the future. We thoroughly enjoyed our stay at this home. I say “home” because that’s what it feels like. This home has everything to make your trip to the Florida Keys enjoyable. The amenities inside and outside were very nice. The neighbors were friendly and the parking was perfect. Ms Jane was a pleasure to deal with and I would recommend her home to everyone. I wouldn’t change a thing! Beautiful home and great location. We enjoyed visiting the FL Keys. Our first time and we had fun boating and snorkeling. We docked our boat at the home which made it so convenient. Home was very clean, beautifully decorated and comfortable and owners were friendly and helpful when we called them for information. Loved our vacation stay! This home has everything you need. Clean home, deck for sunny mornings as well as patio below. Easy access on the canal to the Gulf or Atlantic waters. The manatee family daily in the canal was a sight to see. We will definately book again! The property is less than 1 mile from the Village of Islamorada Founder's Park where you can enjoy a public beach, state of the art Olympic public pool, basketball, tennis and walking. Ramp facilities at the park.